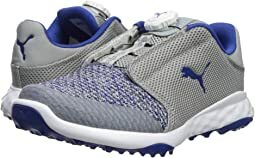 The goal at PUMA Golf is to bring a game enjoyment message to life through high-performance and stylish products. PUMA believes the game of golf should be colorful, innovative, stylish, and most of all, fun. 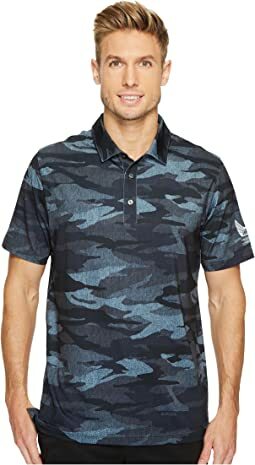 From the occasional weekend warrior to pro Rickie Fowler, everything PUMA does and every product they create, is focused around helping golfers everywhere enjoy the game. Look Better. Feel Better. Play Better. This shoe was great right out of the box. Brought them to the Masters new and walked 5 days straight with them. I would certainly buy them again. Very comfortable shoe, light weight, with good grip. Like the understated colors and graphics. Will be great fair weather shoes. Great shoe, looks and feels good. Haven’t played in them yet, but like the disc over laces. Order 1 size to 1/2 size smaller. Wear 10.5 in Nike running and 10 in other brands. 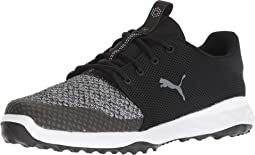 ordered 9.5 in the Puma based on other reviews and fit perfect. I have come to like Puma shoes. The style of their golf shoes are nice to look at and they really feel comfortable. This skirt was just fine. It did not fit like i hoped it would. Was a little awkward around the waist but i did really like the silicone inside the shorts to keep them in place. I think I’ve found the perfect warm weather golf show alternative to a golf sandal. In the past I couldn’t wait to get my shoes and sock off so my feet could breathe. With this light airy shoe body I know I can wear a thin sock or non at all and my feet will stay comfortable. That being said, if the course is wet or there is dew on the grass you might get wet feet. 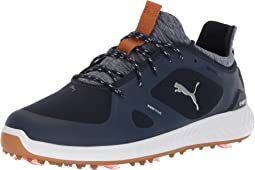 These golf shoes are wonderful-stylish, comfy and waterproof! These are my second pair. The description said they were pink and white, but they are solid white with a textured design. The photo showed the shoe I received. Very happy with them. Sizing is definitly at least a half size too large. The lacing takes a little getting used to, but works great. So far traction is very good. Havnt worn in the rain to tell on water resistance. So far so good. Very comfy after 18 holes, I have flat feet so they worked out great. LOVE this shirt EXCEPT for the cheesy patch on the sleeve! Being a “former” Marine, having any semblance or attempt at utilizing some kind of “military look” isn’t genuine “style” unless it’s authentic—which means just don’t do it at all. Lose the patch, you sell more shirts in my opinion. I love these shoes, golfing in warmer climate so they are perfect. Can be worn without socks, they breath. I would get another if they had a white pair. Comfortable. Nice fit, nice style. Lightweight. I loved the way it fit I am a tennis player and the middle pocket was great in keeping the balls secured while I served. I have a 34ddd chest so I ordered the large it was perfect. I normally wear a 7 1/2 wide due to toe bump problems but they didn't have wide so I purchased the medium. I was surprised to fine that they fit great because of the mesh like top. Have worn them twice playing 18 holes wearing no show sport socks and they were very comfortable and really gripped the ground so I wasn't sliding in my swing. Although they did rub on the side of my little toe, but I have always had a bit of a problem with that. I live in Hawaii and I highly recommend them as they breath and are light weight for wearing in the tropical heat. I LOVE these sneakers. I am tall and thin and have had the worst time finding sneakers that don't look like cinderblocks on my feet. The current styles are all so thick and bulky. These are thin and trim. They are narrow, but I have narrow feet so they are perfect for me. I wear 8-8.5, bought the 8.5 and they are just right. They are light weight and nicely cushioned all around. Super comfy right out of the box, with or without socks (I'm a no-socks gal). I thought the lace was going to be too feminine for my taste, but it's very discreet. Note: I am not a golfer, I bought these for every day wear. The tread is subtle and soft and they look just like any athletic shoe. I'm thinking of getting a second pair in another color, I love them that much! I really liked these, but returned them due to the material. They are super lightweight and incredibly comfortable right out of the box, but the material at the toes felt like it was not sturdy enough. There are no toe caps and the material is rather thin. I could just imagine a hole appearing before any other part wore out. Maybe not, but wasn't willing to take the risk. Bought these for my husband and he loves them. Size was true and the light weight of the shoes whas what he liked best. Can hardly wait to hit the links. Ordered 9 and 9 1/2 . The 9 is really narrow. Fine for me but if you have a normal foot I think you would find it tight. The 9 1/2 was quite a bit wider but too big. The looks were great! I just ordered a half size smaller for that perfect fit. Thank you ZAPPOS for making returns so convenient!